Ever since she was very young Emily has had a strong love for animals and a true passion for animal care. She currently lives in Cambridge Ontario with her Husband, two young children, two enthusiastic Boston terriers and their handsome senior cat. When she’s not at work Emily enjoys working in her garden, putting on a record and dancing with her kids. She started with Woodlawn Veterinary hospital in 2006, working for 7 years as a receptionist. She then took 3 years off to start a family. She is happy to have returned to Woodlawn in the fall of 2016 as Office Manager and as always, strives to provide our valued clients and patients with individual quality care and is excited to make positive contributions in her new role. 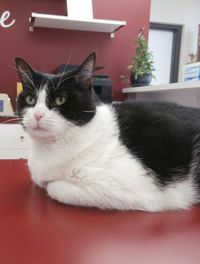 Vicki is a graduate, with honours, from the Animal Care program at Sheridan College. She is also a graduate from the Veterinary Technician program at Seneca College. She has loved her time working as a Veterinary Technician since 1994. Vicki has a special interest in the nursing and surgery side of her job but also enjoys assisting the doctors with appointments, radiographs and lab work. In her spare time she loves watching her boys play their various sports. You can usually find her at an arena somewhere when she’s not at work. Vicki shares her home with her family and an assortment of feathered, furred , shelled and finned pets. Alyssa grew up in Dorchester, Ontario (a small town east of London). She always knew she wanted a career involving animals because she enjoyed taking care of her family's cats and dogs. 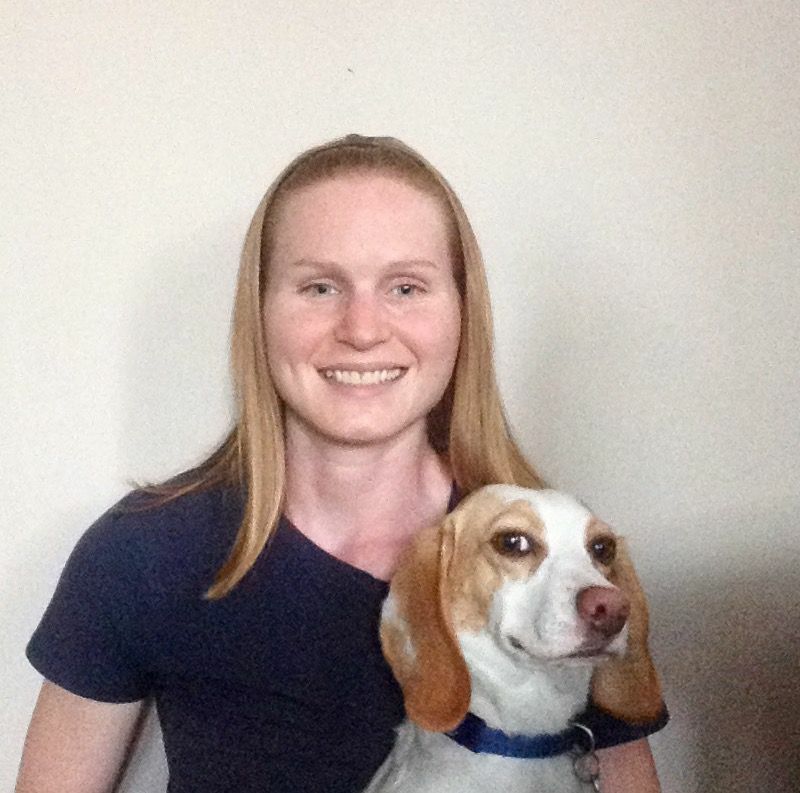 She earned a Bachelor of Science degree in animal biology from the University of Guelph in 2009, and a diploma in Veterinary Technology from Ridgetown College in 2011. 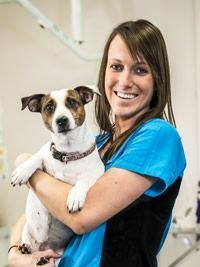 ​​​​​​​Since becoming a Registered Veterinary Technician, she has worked at vet clinics in Stratford and Simcoe. 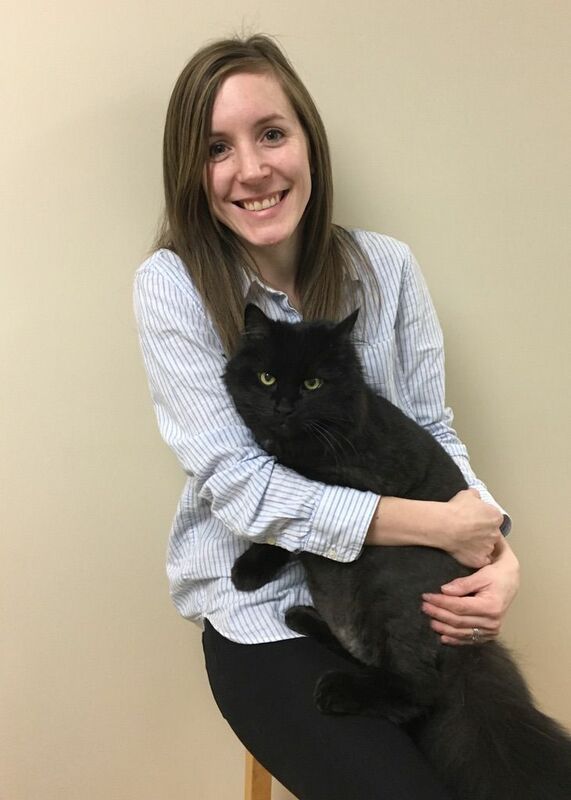 She moved back to Guelph and joined the Woodlawn Veterinary Hospital team in August 2016. Alyssa has a very cute 2 year old beagle named Copper, who loves going for walks and getting treats. Gayle has been with Woodlawn Veterinary Hospital since 1989. She enjoys working with her colleagues, the clients and their pets. She is a helpful, friendly presence at our front desk and always aims to present a positive outlook. During her years with WVH, she has come to consider many of our clients as friends. Gayle is our morning receptionist and is often seen leaving after her shift with her boots and riding gear already on for an afternoon of horseback riding. 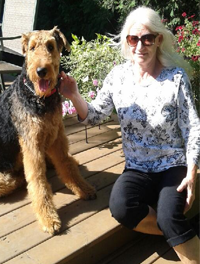 Her family also has a 90lb airedale terrier named Austin, who gives them plenty of opportunity for exercise and have fun. Sarah has always loved animals and nature from a young age. She developed a particular interest and passion for horses allowing her to maintain and explore this love through riding. 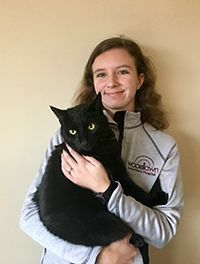 She pursued her interest in animals and the environment through a Bachelor of Science Degree at the University of Guelph, and a post-grad at Conestoga College. 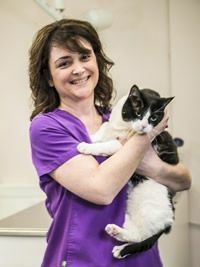 She is happy to have found a place at Woodlawn Veterinary Hospital and looks forward to forming relationships with the clients and patients by aiding in the care of each individual pet. ​​​​​​​In her spare time Sarah can be found jogging, writing, horseback riding, or spending time with her cat, Domi. We wish Kim all the best on her third maternity leave. We are lucky to have such a good kitty to greet us each morning and many clients are used to finding Moo stuffed in a shelf up front or watching from a distance. She may offer to do a cat scan but although she is very black and white, her results never seem very helpful.